Three MHS students may compete at nationals, while others placed at state competiton. 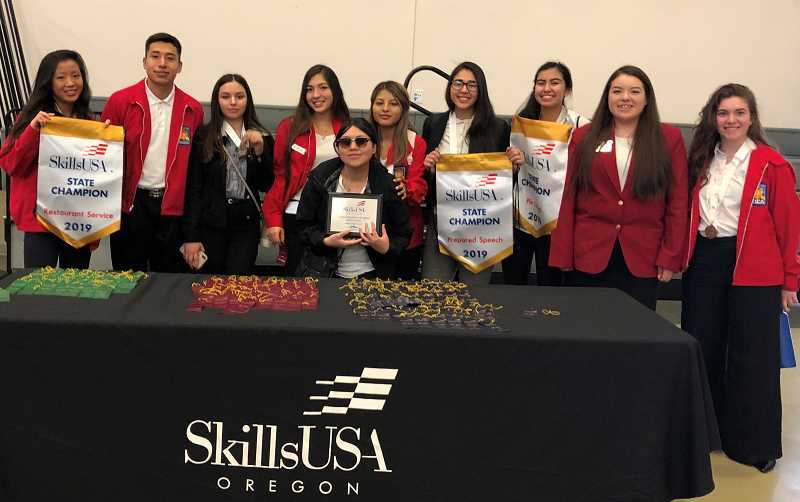 Three Madras High SkillsUSA members received gold medals at the 2018 SkillsUSA State Leadership and Skills Competition recently held at Camp Withycombe in Clackamas. Only gold medalists can compete at the national conference in Louisville, Kentucky, in June. Gigi Albarran's design for the Gold Medal State Pin will be worn and traded by all national conference attendees in June. Kelly Huang took the gold in Restaurant Service, placing higher than students training in culinary programs around Oregon, and Madras did a "medals sweep" in Prepared Speech, taking home all three medals. Erika Olivera received gold, Elan Rios received silver, and Allison Turek received bronze. Thalia Culpus placed fifth in Job Skill Demonstration, and Jasmine Lopez made it to the top 10 in Job Interview. Lopez also completed her year as a SkillsUSA state officer. The Quiz Bowl team, including Kelly Huang, Erika Olivera, Kelsey Olivera, Katherinne Parodi, Allison Turek, and Elan Rios placed fourth and the chapter earned a "Quality Chapter of Excellence Award" for their work this year. The second annual SkillsUSA talent show has been rescheduled for April 2 and 3, after being postponed in late February, due to snow. The show will feature students from third through 12th grade. The first day of the talent show serves as the first round for competitors, and the second day will be the finals. Both days of the talent show, the doors open at 6:30 p.m. and the show begins at 7 p.m. at the Madras Performing Arts Center. On the second night of the show, door prizes will be awarded, including two passes to Silverwood Theme Park and a pass for five to Oaks Amusement Park skating rink. Each person receives a ticket with their admission, to be entered into the drawing, but additional prize tickets can be purchased as well. Attendees must be present on the second night of the show to win. Admission is $5 at the door on each night or $8 for a ticket that is good for both nights. The proceeds will help Skills USA students attend their state and national conferences.